Life beyond Christmas and the New Year?.......why not celebrate Burns Night with us and your friends? 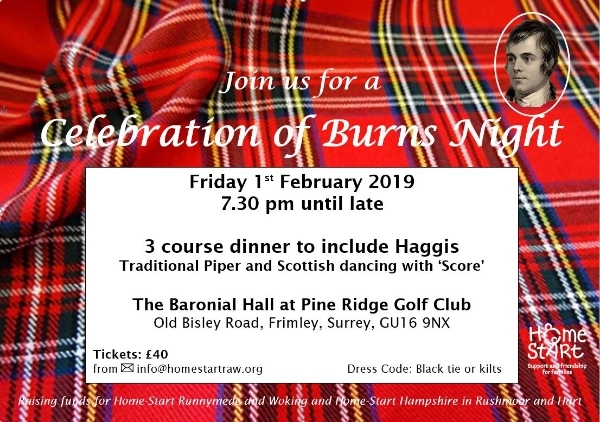 A fun, exciting and sociable evening of Scottish-style entertainment and food. Bring your friends along and join us for this wonderful evening. You need to book your place AS SOON AS POSSIBLE as places are limited! A night not to be missed if you enjoy all things Scottish! 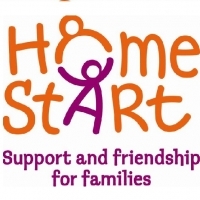 Home-Start Runnymede and Woking is a charity which offers friendship and practical support for families with young children in the boroughs of Runnymede and Woking. Trained volunteers visit referred families for a couple of hours each week to offer support where parents may be struggling with the challenges that parenting young children can sometimes bring. This could include being a lone parent, a disability of parent or a child, behaviour, multiple births, post natal depression or poor mental health or even social isolation where the family has no friends or family locally to help them at a time when they need it most.